Rollie's is where all of the locals go in Sayulita and is known for its friendly service (its a rule that "no one go hungry") while offering the best breakfast in town. 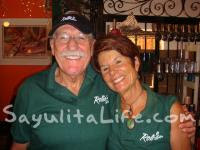 "The restaurant is located just south of the square on the back road out of town towards Punta de Mita. If for some reason your eyes fail to miss the giant yellow sign, your sense of smell will easily guide you to source of the aromas of bacon, eggs, and coffee."